by Tommy Goudge (May 17, 2013) – Ohsweken Speedway’s 18th season of competition began on Friday night with Glenn Styres (Corr/Pak Merchandising Sprint Cars), Cory Turner (Affordable Towing & Recovery Thunder Stocks), Davey Boughton (HRW Automotive Mini Stocks), and Jesse McDonald (Gale’s Auto Aftermarket Bombers) visiting Klotz Canada Synthetic Lubricants Victory Lane. Styres started the Corr/Pak Merchandising Sprint Car feature on the inside of the second row, and quickly took the lead from Derek Jonathan. The race was halted once for a red flag, after Todd Hoddick took a wild tumble in turn one. 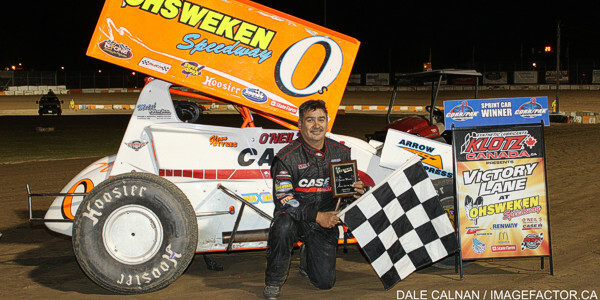 Styres overcame nose wing damage to take the win, his 17th career feature victory at Ohsweken. Chris Steele, Mitch Brown, Mikey Kruchka, and Dave Dykstra rounded out the top five. Glenn Styres, Travis Cunningham, and Mitch Brown claimed heat race wins, while Dain Naida won the B-Main, and Mikey Kruchka received the Nathan Ackland State Farm Insurance “Top Gun” award for accruing the most heat race passing points. The first Affordable Towing & Recovery Thunder Stock feature of the season was hotly contested, but in the end Cory Turner emerged from the pack to win over Jim Lampman, Devin Habiuk, Mike Miller, and Lee Winger. Brad Bacher, Steve Hess, Ryan Turner, and Chris Dickie won the heat races, while Karl Sault won the B-Main. There was a familiar car in victory lane with a rookie driver after the HRW Automotive Mini Stock feature. 2012 Bomber champion Davey Boughton piloted the former Jeremy Hughes ride to the win over Robin Elliott, Alex Schuts, Dave Goodacre, and Laura Hughes. 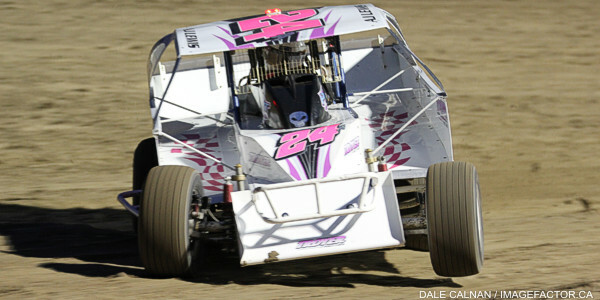 Robin Elliott, Jason Lungaro, and Laura Hughes won heat races, while Dale Gyokery took the victory in the B-Main. A four car race for the win made the Gales Auto Aftermarket Bomber feature exciting right to the end. Jesse McDonald started on the pole and led the entire event, but he had to make his way through traffic while fending off challenges from Brady Longboat, Dusty Deboer, and Max Chechalk, who finished in that order, with Tim DeBoer rounding out the top 5. Brady Longboat and Dusty DeBoer won the first Bomber heat races of the season. Grisdale Racing Products presents the “Sportsman Shootout” next Friday, May 24. The Corr/Pak Merchandising Sprints, Affordable Towing & Recovery Thunder Stocks, HRW Automotive Mini Stocks, and Gale’s Auto Aftermarket Bombers are all part of round two of Ohsweken’s weekly Friday night racing series, along with the return of the Sportsman for the first time since 2008. Gates open at 6:00 with racing starting at 7:30! Advanced reserved seat tickets are now on sale for the “Northern Summer Nationals” featuring Tony Stewart on Monday, July 29, the World of Outlaws Sprint Car series “Six Nations Showdown” on Tuesday, July 30, and the 9th annual Canadian Sprint Car Nationals on Friday, September 13, and Saturday, September 14. Tickets for the Bryan Baeumler Meet & Greet BBQ coming up on Friday, May 31 are also available for advance purchase. 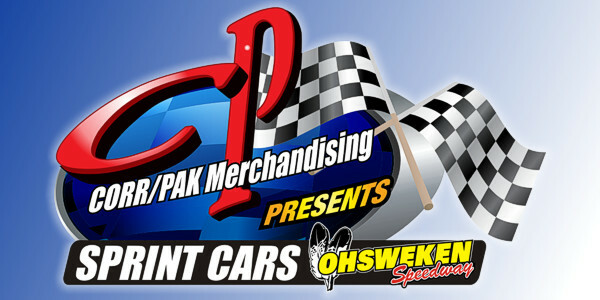 Please visit www.OhswekenSpeedway.com and check out our new system for online ticket sales. 1. 71 Travis Cunningham (Grimsby), 2. 01 Mikey Kruchka (Hamilton), 3. 5d Dave Dykstra (Port Colborne), 4. 3r Shane Ross (Thedford), 5. 49 Todd Hoddick (Cheektowaga, NY), 6. 11 Jamie Turner (Caistor Centre), 7. 31 John Burbridge, Jr. (St. Williams), 8. 4z Joel Lehman (Elora), 9. 5 Keith Dempster (Alton) DNF. No Time. 1. 10 Mitch Brown (Brantford), 2. 81 Derek Jonathan (Lewiston, NY), 3. 5c Conor Mahoney (Waterdown), 4. 21j John Burbridge, Sr. (Simcoe), 5. 30g Stevin Goldner (Aylmer), 6. 9nz Havard Daniels (Coatesville, NZ), 7. 90 James Evans (Beamsville) DNF, 8. 27h Tom Huppunen (Fenwick) DNF. No Time. 1. 91 Ryan Turner (Caistor Centre), 2. 73 Mike Miller (Caledonia), 3. 00 Robbie General (Ohsweken), 4. 911 Nick Liverance (Brantford), 5. 87 Jeremy Bean (Stoney Creek) DNF, 6. 3b Blaine Barrow (Welland) DNF, 7. 48 Mike Graham (Caledonia) DNF, 8. 10 Jake Brown (Brantford) DNF, 9. 12 Brad Herron (Waterford) DNF. No Time. 1. 99 Robin Elliott (Woodstock), 2. 81 Alex Schuts (Oakland), 3. 18x Davey Boughton (Carlisle), 4. 01 Mark Da Silva (Waterdown), 5. 21 Jonathan Ayrton (Dundas), 6. 55 Rob Slater (Dundas), 7. 84 Dale Gyokery (Jarvis), 8. 22 Brittani Myers (Hamilton), 9. 69 Rob Twitchett (Dundas). 1. 7 Jason Lungaro (Hamilton), 2. 69e Dan Erskine (Caistor Centre), 3. 64 Doug Erskine (Hamilton), 4. 79 Steve Miller (Paris), 5. 16 Jeremy May (Binbrook), 6. 11 Mike Giberson (Caledonia), 7. 96t Mike Taylor, 8. 76 Jamie Goudge (London), 9. 35 Brock Ducharme (Hamilton). 1. 10 Laura Hughes (Puslinch), 2. 38 John Cote (Hamilton), 3. 05 Dave Goodacre (Brantford), 4. 7x Chase Hess (Ohsweken), 5. 66r Cole Rodwell (Caledonia), 6. 66 Jon Janssens (Woodstock), 7. 1 Kathi Dickie (Brantford), 8. 12 Chantelle Hyatt (Millgrove), 9. 90 Chad Smelser (Dunnville). 1. 84 Dale Gyokery, 2. 22 Brittani Myers, 3. 90 Chad Smelser, 4. 69 Rob Twitchett, 5. 1 Kathi Dickie, 6. 12 Chantelle Hyatt, 7. 96t Mike Taylor, DNS. 76 Jamie Goudge, DNS. 35 Brock Ducharme. 1. 66 Brady Longboat (Ohsweken), 2. 88 Jesse McDonald (Caledonia), 3. 6 Wayde Thorne (Waterford), 4. 18 Adam Hallett, 5. 43c Clinton Nicholls (Hamilton), 6. 03d Dakota Potts (Waterford). 1. 23 Dusty DeBoer (Hagersville), 2. 97 Max Chechalk (Hamilton), 3. 9 Tim DeBoer (Caledonia), 4. 7L Valen Longboat, 5. 36 Skip Brandow.